A Solair in GTA San Andreas.. The Solair is a four-door station wagon featured in Grand Theft Auto: San Andreas and Grand Theft Auto IV. It is similar to the Stratum, but much less appealing, due to a more "family" oriented design and somewhat inferior performance. The Solair in GTA San Andreas resembles a second generation Ford Taurus station wagon. Despite its unappealing appearance, the Solair possesses above average performance, with good cornering and grip (complemented by soft suspensions), moderately good brakes, good acceleration and top speed, and average endurance. Its suspension configuration, however, may lead to a higher risk of rollovers if the vehicle encounters bumps or uneven terrain when being steered. The Solair is considered a common car, popping up in traffic at any given time, no matter the location. It has no permanent parking spot. A Solair in GTA IV (Rear quarter view). 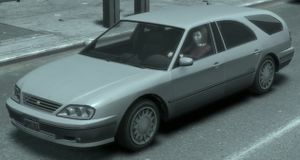 In Grand Theft Auto IV, the Willard Solair resembles a fourth generation Mercury Sable station wagon but the rear side windows aren't rounded and the taillights appear to be inspired from an eighth generation Lincoln Continental, however the general shape is still similar to the Sable; unlike the Sable, however, it has a more modern and luxurious appearance given by the doorhandles, bumpers and miscellaneous chrome. The car also bears "EP2000R" badges on the side. The Solair is a hefty station wagon, powered by possibly an inline-4 or V6, coupled to a 5 speed gearbox in RWD configuration. Acceleration is mediocre, slightly slower than its competition. Top speed however is slightly higher, thanks to a more torque-y engine: 87 mph (140 km/h). Handling-wise, the Solair retains much of its inspiration's characteristics, being quite sporty for a mid-sized wagon, with good posture in the bends and relatively level cornering. The suspension is fairly soft, leading to body roll, though very little oversteer can be felt. Crash deformation, thanks to the heavy chassis and frame, is well above average, sustaining much damage before failing; though engine build quality is unimpressive, with it failing after only a few impacts. Overall the Solair is better suited towards ramming and drive-bys than high-speed applications. In GTA San Andreas, the front of the Solair is very similar to the front of the Stratum, another station wagon. People who play the game infrequently often get the two cars confused, however, the Stratum has a more streamlined form. The two cars are also very similar in GTA IV, although less so. To further distinguish the cars, the Solair in GTA San Andreas has the same sounds as a ZR-350, while the Stratum has the engine sound of a taxi and horn sound of a [[Banshee] (a note lower than the Solair's). WCTR in GTA San Andreas. IF99 and K109 The Studio in GTA IV. After collecting all thirty cars for Stevie in GTA IV, a Solair may be sold at his garage for $2,000. This page was last modified on 17 May 2015, at 02:57.